After the success of the first two CD's, released in 1997 and 1999, we decided that we should release a new edition of the Utility Guide to celebrate WUN's 10th anniversary. Editing the CD took more time than anticipated but after a lot of blood, sweat and tears we're finally there. In total we have for you well over 800 audio files, almost 600 images, and more than 400 text files. I trust you find the CD worthwhile and of use. About WUN General info about the Worldwide Utility News club, Spunkle's "WUNsong", and the sponsors page. Audio Recordings of hundreds of ute stations, including many historic ones. Also included is a section which covers the various digital modes, complete with samples and characteristics. Files WUN newsletters and columns, Special Topics Reports, logs, sample messages, and ute info files. Images Fax (images of weather and press stations), Hellschreiber samples, Miscellaneous ute related pictures, QSL cards, SSTV samples. Software Several handy tools, including NRD535/545 remote software, propagation software, and decoders. Here is a review of the Volume 3 CD by Bob Margolis. The CD interface is written in standard HTML, so it should be viewable by any web browser which supports HTML v4 or higher. The browser configuration should support the following file types in order to view all the contents of the CD: html, gif/jpg images, wav/mp3 audio files, text, pdf files, and MS Excel .xls files. Note that if the CD does not autoplay when inserted into the CD-ROM drive, the CD browser interface can be launched manually by opening the CD-ROM drive root folder and double-clicking on the "default.htm" file. The WUN Utility Guide #3 CD-ROM may be ordered for only U.S.$24.99. This price includes postage to U.S. addresses and airmail postage elsewhere in the world. Payment must be in U.S. dollars and may be in checks from U.S. banks; international bank checks or money orders (make checks & money orders out to "WUN"); or by courtesy of a local company, MagMusic, VISA or Master Card. All credit card orders will show "MagMusic" as the seller. Checks from U.S. banks require a one-week wait for clearance. Please allow up to 4 weeks for delivery on all orders. 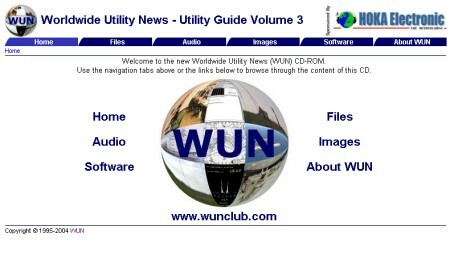 Please send ____ copies of the WUN Utility Guide #3 CD-ROM at US$24.99 each.